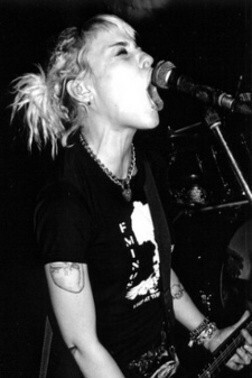 SoCal punks F-Minus comprised singer/guitarist Brad Logan, guitarist Sarah Lee, bassist Jennifer Johnson, and drummer Chris Lagerborg. The group debuted in 1998 with a pair of 7" EPs -- the Hellcat release Failed Society and Pelado Records' Won't Bleed Me -- featuring 19 songs spread between them. Next entering the studio with producer Tim Armstrong of Rancid, F-Minus -- swapping Lee for guitarist Erica Daking and Lagerborg for drummer John Guerra -- released their self-titled full-length debut in the fall of 1999. Suburban Blight followed two years later. Shifts inside the band continued. Bass player Joe Steinbrick and drummer Adam Zuckert solidified F-Minus' lineup by 2002, allowing the band to finally head into the studio for a third album. F-Minus joined producer Steve Albini for the anxious Wake Up Screaming, which appeared on Epitaph in March 2003.